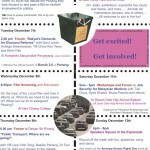 at the inaugural speakers’ square speeches – welcome! 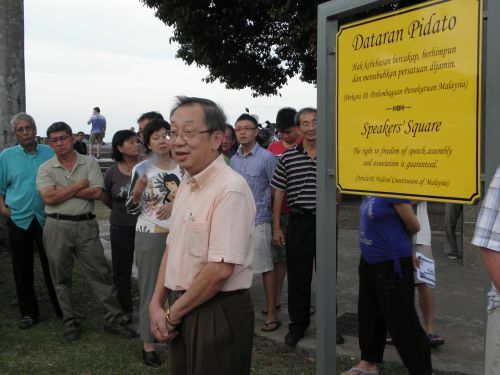 the speakers’s square in penang was launched on 4 may by the CM. we were then told that it will be opened for the public to speakl only wednesday and sunday (6.00pm to 10.00pm). 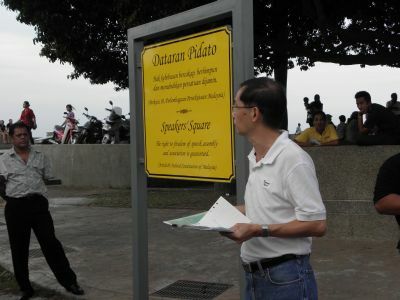 well, 5 days later, on 9 may, sunday, the speakers’ square see its first inaugural speech when NGO, suaram penang together with sembang-sembang forum organised its first public speech there. the ringing of a bell attracted people to gather round the speakers square plaque where the people making the speeches will be standing. it was a good idea to use a bell as many people who had gathered for the speech in the wide esplanade field were quite spread out. beside, it also attracted passers-by. first up was ng eng kiat from suaram who explained that together with the sembang-sembang forum group they organised this session to arrange for some speakers to speak up. to say no to the star. i notice there were some star reporters around but they didn’t say anything. the next speaker was dr. k.g. pa (1st pic, on the right. on left is eng kiat) from sembang-sembang forum who spoke on the freedom of information and press freedom. he touched on all those laws that restricts on the freedom of information e.g. ISA, OSA, PPPA, sedition act. 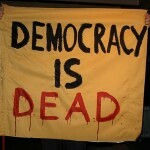 he said that there is an urgent need for the freedom of information act to be enacted. up next was a man, wilson who just introduced himself as a registered voter. he complained about the attitude of many of the PR reps, especially the new ones. he said that before the election, they were very friendly but after they were voted, in, they seemed to be arrogant. he wanted the CM to define a clear ‘road-map’ for penang as he said with that, then he will consider voting for them again. 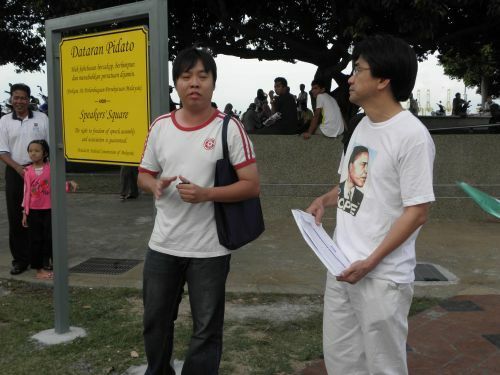 andre loh, a founding committee of the speakers’ square and also a long time church friend of mine was next to speak. i didn’t quite catch what he spoke on as his voice was rather soft. anyway he gave out copy of his speech made during the launching and i thought he spoke based on the speech (which i had it up at my blog posting when i posted about the launching). mr tan, came up to speak again – this time he spoke about the penang international convention centre (PICC) a RM50 mil. project of the government next to the existing PISA, of which he strongly opposed. in fact, he had started an online petition to halt the project. he gave his reasons on why he opposed the projects like there is already a convention centre (PISA) nearby which is under-utilised, parking problems. the massive cost involved which is to bear by the council also irked him as he said the money from the council is not suppose to be spend on a convention centre. i thought he spoke too long and i can see people started to get bored. me too. some people were leaving i notice. methinks all the speeches should be 5 mins only… unless it is an interesting speech with lots of humour. his speech on the PICC is so factual based that was why i found in boring. anyway after he spoke, eng kiat, asked the crowd, which stand about 5o people, if anyone of them would like to come up to speak. none did. then he introduced former exco, dr toh kin woon (3rd pic) to speak. dr toh spoke in his impeccable bahasa. ah his speech was very brief and to the point. that’s how it should be. he said he welcome with joy and anticipation the opening of the speakers’ square as he said to speak up freely is a fundamental rights of the public. although there are restrictions to the freedom of speech, he said, but having a speakers square is a good start so he hope the public will made use of it to air their views. i’m glad that i was present that day as it was a historic day – the first speeches session at the speakers’ square. 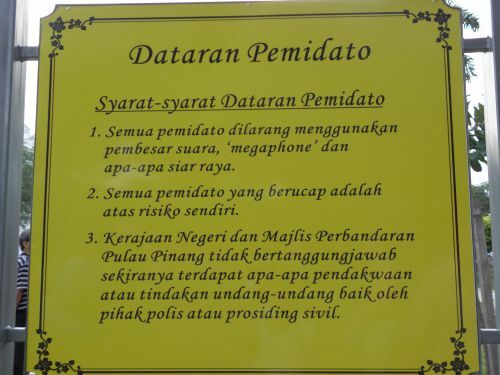 oh btw, i understand from andre, if i’m not mistaken actually both sides of the plaque contain the same words (speakers square in english and bahasa) but on saturday, the council had replace one side of it with… rules!! see the last picture – the rules clearly spelt out. read the report from the star and the sun. note: all pictures here taken by yours truly.